Even if you do your best to try to plan for future growth, there will be surprises along the way. This eBook highlights the importance of being able to plan accurately for growth, and suggests areas of your business that you can critique to assess your ability to effectively plan for growth. It also identifies the risk factors and consequences that manufacturers who don’t plan for growth leave themselves open to. 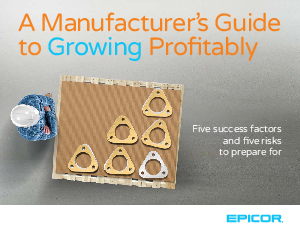 The eBook concludes that, whether addressing risk factors or embracing growth factors, it’s their IT systems that will make or break manufacturers’ growth ambitions. With the right IT in place, they’ll be able to make better and faster decisions, helping them provide better and faster service to customers even as they grow, increasing their agility and their profitability.